If you are like many of our clients, you may not have started out thinking you wanted to build a custom home; however, after looking at the inventory of houses for sale in St. Louis, MO you’ve started to realize that many of the older homes in the most desirable neighborhoods require a significant amount of work to make them desirable and up to your discriminating standards. Now you are considering your options and that’s where Kingbridge Homes comes in. We specialize in infill construction, whereby we build new houses on existing lots in some the most sought after communities in the greater St. Louis area. Whether you are interested in building your dream house from the ground up or you prefer the simplicity of purchasing a move-in ready Kingbridge home, we are here to help. Kingbridge Homes is one of the most successful private homebuilding companies in the St. Louis metro area. 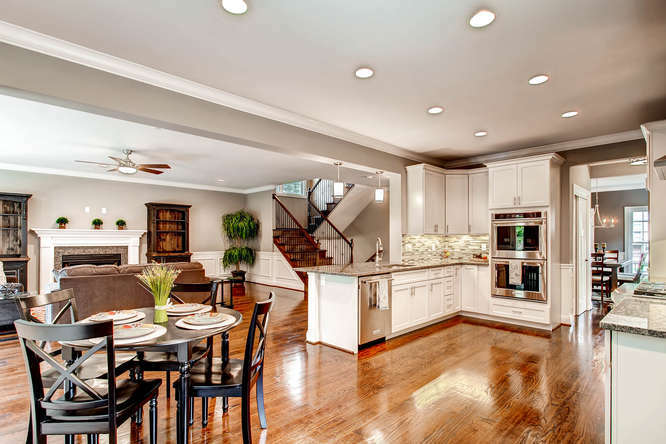 Our team is recognized for our extensive experience and knowledge, a well-respected reputation among St. Louis home builders and our core philosophy that the customer comes first. We are a team with design-build experience, meaning we can help you navigate the custom home building process from start to finish. Even if you’re unsure of exactly what you’re looking for, the experts at Kingbridge Homes can provide you with a wealth of ideas to create a home you’ll be proud to call your own for many years to come. When you choose to work with us, you can expect nothing less than highly personalized attention and a dedication to ensuring your budget remains top of mind. If you’re one of the many people looking at St. Louis homes currently listed for sale, consider rethinking your strategy and go custom. It’s easier and more affordable than you might think! Contact Kingbridge Homes to set up a complimentary consultation to learn more and start planning your dream home today!